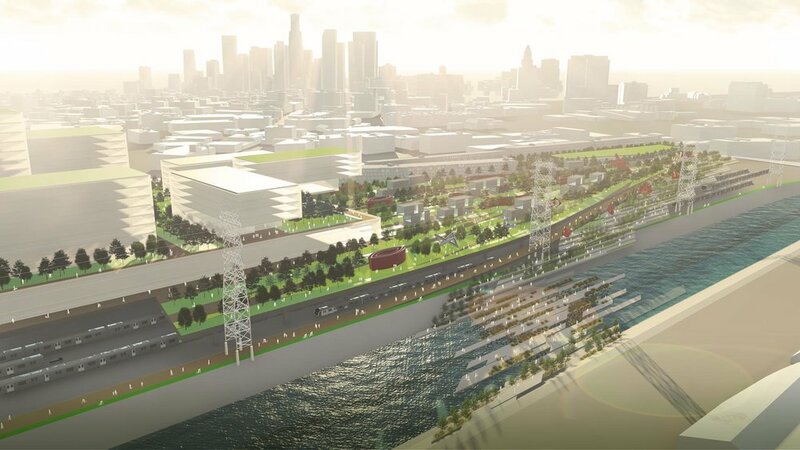 NEIGHBORHOOD IN TRANSFORMATION The segment of the Los Angeles River in Downtown LA, located between the 1st Street and 4th Street bridges, is at the heart of a neighborhood undergoing rapid transformation. The west bank of the river is the eastern boundary of the Arts District where major buildings have been constructed or adapted in recent years, and where a large number of projects are planned and currently underway. These projects include creative office spaces, hospitality facilities and large mixed-use developments as well as thousands of new housing units to serve a fast-growing resident population. 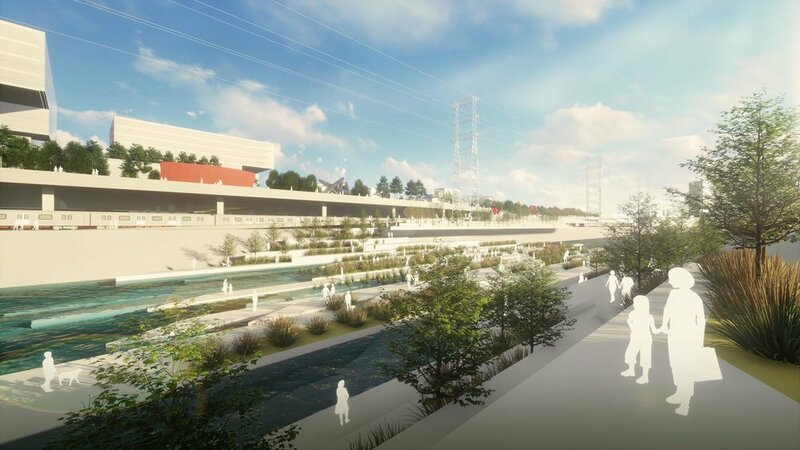 However, only one of these projects to date directly engages the riverbank as the Arts District is currently separated from the LA River by a wide swath of rails and other infrastructure. CAPPING THE RAILS At the outset, the existing rails and maintenance facilities that currently occupy the entire site have been assumed to remain in place for the foreseeable future. This led to the concept of vertically layering uses by capping this infrastructure and creating new usable land above. 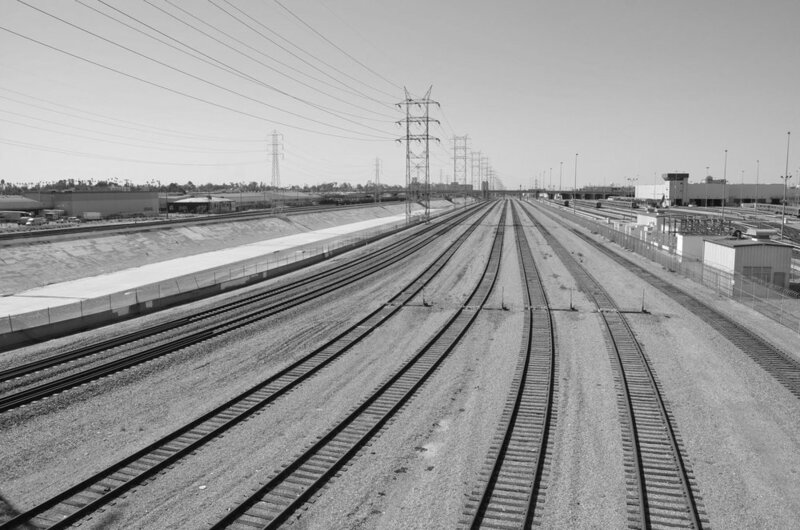 Railyard capping projects of a similar scale in New York, Chicago and Seattle were compared to the undertaking considered on this site to verify its’ feasibility. The 34-acre site is comparable to the 28-acre Hudson Yards district in New York and the 25-acre Millenium Park in Chicago, which were both built over very large railyards to provide park space and cultural amenities within a dense urban environment. A RIVERFRONT SCULPTURE PARK A major part of the new land created above the rails is devoted to a large public park of approximately 10 acres with native vegetation, passive uses, active amenities, and wide views of the river and the Downtown skyline. Given the adjacency of the Arts Districts and the proximity of Sci-Arc, the park is envisioned as a place to view large outdoor sculptures and exhibit artwork in a series of gallery/maker spaces, which could be simply housed in prefabricated structures in keeping with the industrial character of the site. Along the bank, the sculpture park becomes a stepped promenade forming cascading gardens overhanging the existing channel, making it possible to view the river during high water. The promenade continues to step down to reach the riverbank below and descends into the channel itself as a playful set of stepping stones and aquatic gardens that foster habitat, help cleanse the water, and provide access to the riverbed as well as a crossing to the other side during normal flow conditions. ELEVATED YET CONNECTED The riverbank bike path is connected to the park above through a wide, long and gentle ramp along its entire eastern edge. A second ramp along the western edge connects the elevated park back down to street level, arriving at a new plaza proposed adjacent to Sci-Arc. Stairs off of this ramp link up with 3rd Street through the central court of the adjacent One Santa Fe Building. The park is also directly accessible from the 1st Street and 4th Street bridges forming a seamless connection between the existing street bicycle path network and the new River Bike Path below, and encouraging pedestrian crossings of the river. The elevation of the park also coincides with the first floor of housing in One Santa Fe. TRULY DIVERSE AND MIXED USES The concept envisions the development of larger buildings at the southern end of the site for light industrial uses, educational facilities such as an Art School across from Sci-Arc, and to offer a wide range of residential opportunities aimed at addressing the lack of housing accessibility in the neighborhood as it is currently evolving. 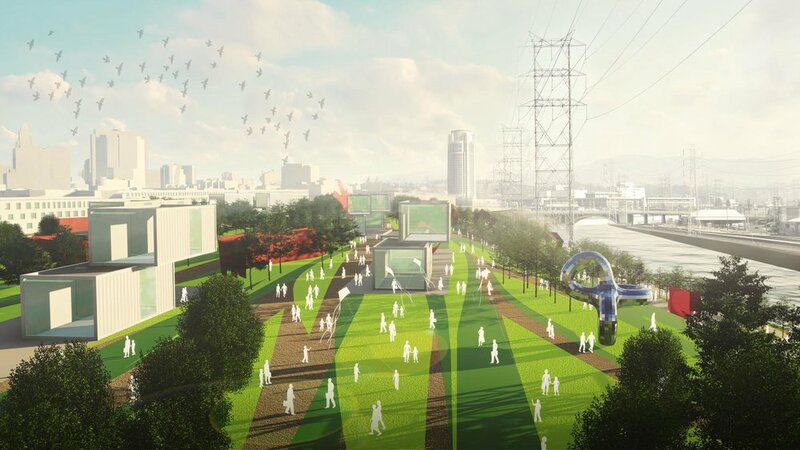 This will make it possible to assemble a diverse resident population living directly on the park and participating in its daily life. Maker spaces in the proposed light industrial podium will open onto the park and become an active extension of its cultural component and a living expression of the Arts District’s heritage. RECONCILING PAST & FUTURE The vertical layering of infrastructure and public uses explored in this concept may be a necessary approach in a densifying city like Los Angeles, where infrastructure already occupies so much land and where single-use land allocation may no longer be sustainable. It is also a powerful way to reconcile the infrastructural purpose of the riverbanks with the pressing desire and need to provide access to a river that links so many of our diverse communities and is a manifestation of our delicate and vital relationship with water.